The Australian Kelpie developed in Australia in 1870, is a wonderful breed known for its natural herding and guarding instincts. This dog breed is known to be very effective with poultry, goats, sheep, cattle as well as with reindeer. 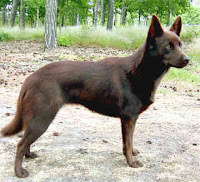 The Australian Kelpie is the most favored breed in Australia and is loved in several other countries around the world. This is a medium sized breed and comes in a variety of colors. The Australian Kelpie is a tough breed with very few medical problems and dog diseases. Like all other breeds of dogs they are also susceptible to some common disorders for example, cryptorchidism, hip dysplasia, cerebellar abiotrophy and luxating patella.